Early on Friday afternoon, Keone Kela emerged from the visitors’ dugout at Safeco Field and stepped onto the manicured emerald grass. He looked around at the majestic green stadium and strolled around the field, taking in his surroundings and soaking in the sunshine on a rare clear and warm April afternoon. “It didn’t seem so big,” he said, smiling. But there was a time when it did. There was a time not long ago that it seemed like a colossal palace, representing the never-ending dream of pitching in the big leagues. That time was just eight years ago, when Kela, who celebrated his 22nd birthday Thursday, was a skinny freshman for Highline High School, pitching in an exhibition game at Safeco Field. But the next time he’ll step onto that mound it will be as a reliever for the Texas Rangers. He is living his dream, and the return to Seattle was a reminder of it. Kela’s path to the big leagues is far from typical. Born in Los Angeles to teenage parents, Kela moved with his mother to the Seattle area at age 8 to escape the gang culture in his neighborhood. He played on myriad select teams in the area. As a senior at Chief Sealth, he helped lead the Seahawks to the state playoffs and earned Metro League co-MVP and all-state honors. “It was the first time we made the playoffs in 26 years,” he said. The Mariners selected Kela in the 29th round of the 2011 draft, but he chose not to sign. He enrolled at Everett Community College and pitched for the Trojans one season, posting a 2-2 record with a 2.07 ERA and two saves in 13 appearances. The Rangers selected him in the 12th round of the 2012 draft. Kela has moved quickly through the Rangers system. Working his way from Arizona rookie league in 2012 to two Class A stops in 2013 and up to Class AA in 2014. He posted a 2-1 record with a 1.86 ERA and five saves in 36 appearances for Class AA Frisco. 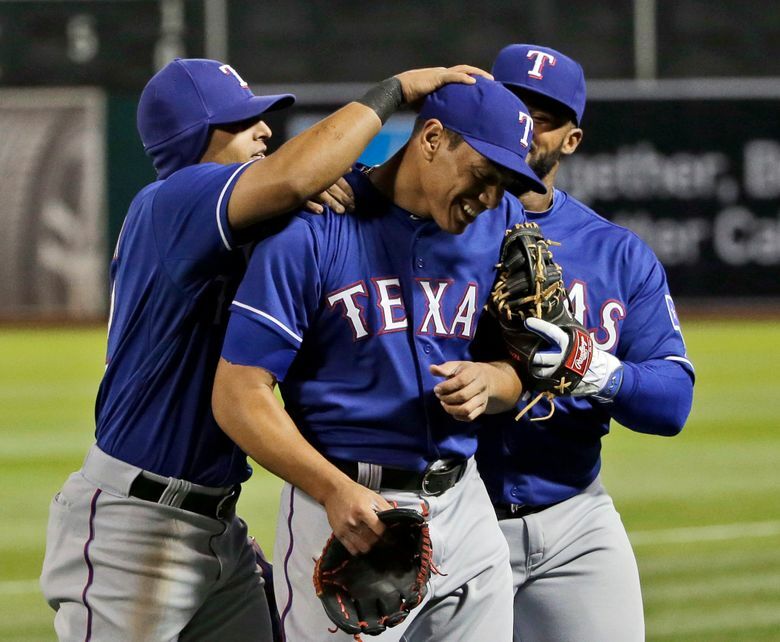 A nonroster invitee to big-league spring training this year, Kela surprised the Rangers and himself, using his mid-90s fastball and outstanding changeup to pitch well enough to earn a spot on the opening-day roster. Saturday, Kela pitched a perfect inning against the Mariners and now has made six appearances this season and allowed just one run for a 1.50 ERA. In his big-league debut against the A’s, Kela worked himself into a one-out, bases-loaded jam. But he got out of it unscathed by getting Marcus Semien to ground into a double play. The realization of being able to compete at the big-league level hasn’t let Kela forget about the journey to get there. He got a slew of tickets for friends, former teammates and coaches for this series. It was important for him to give back. There are times when it doesn’t seem real. There are times that it’s like he’s that 14-year-old kid caught in a daydream about pitching on the mound at Safeco Field or any other big-league park.